Good Morning! Sometimes when you have a statement piece in an outfit like this gorg, floral blazer, it's fun to white out everything else so the color really pops. And for a causal look, messy buns are always my go-to! such a cute blazer with the all white outfit!!! love the purse n necklace...so pretty!! cute blazer!! Gorgeous! LOVE the floral blazer, so pretty.. 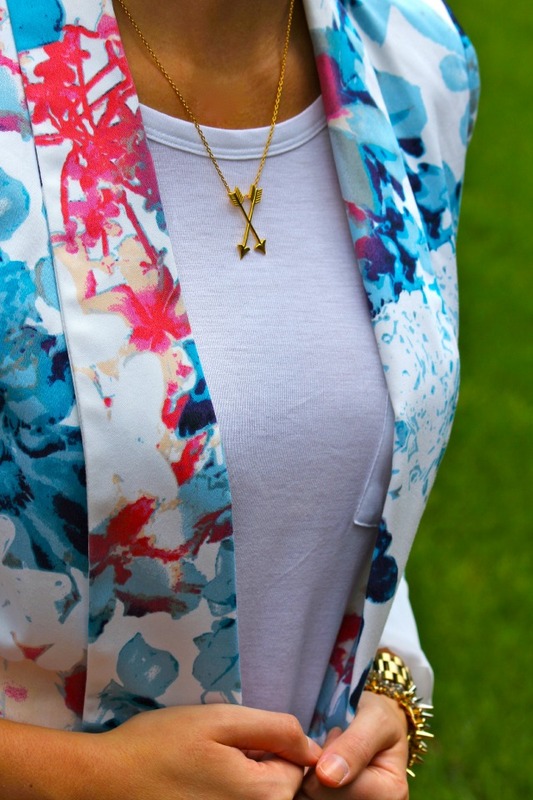 The floral blazer is perfect with the white on white! Love this! I love that blazer...I've been on the hunt for a floral blazer, and this one is a great price. Also, I love that you styled it with all white. Adore your blazer and necklace !!! Love the white on white look! The blazer is the perfect addition! Loveee! Does the blazer fit true to size? What a steal on the blazer! Love this outfit! That blazer is beautiful...and the all white really makes it stand out more.